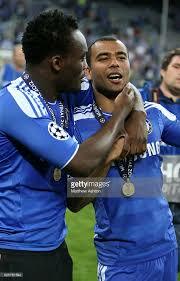 Indonesia bans Essien, Cole – Royal Times of Nigeria. Indonesian authorities on Tuesday banned Michael Essien and Carlton Cole from playing until they get work permits after their new club did not obtain the necessary documents for the ex-English Premier League players, AFP reports. The two were signed with great fanfare last month by Persib Bandung, one of the country’s best clubs, in a boost for Indonesian football as it seeks to bounce back from a FIFA suspension and launch a new league. But the government-backed Professional Sports Agency found the players did not have the required work permits. The club admitted they had not finished processing the paperwork for the pair before they made their debuts in the country’s new top-flight Liga 1 at the weekend. After calling in the players and Persib’s management for questioning, immigration authorities said Tuesday the pair would not be able to play until they obtained the permits. Persib said they would abide by the ban while working to get the permits. Joko Driyono, the secretary general of the country’s football association, said they would help the club in obtaining the documents. Persib said it had sought to process the paperwork a few days before the stars’ first match on Saturday. The permits were not ready on time, but the football association and league organiser gave them permission to play.